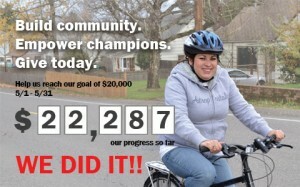 Home » Blog » Reaching new heights this spring – $22,287 raised in one month! Reaching new heights this spring – $22,287 raised in one month! On Friday, May 31st, a group of 178 supporters, volunteers, and new friends joined us at our new workshop space, filled with bikes, beer, and BBQ, to celebrate the completion of our most ambitious spring fundraising campaign to date. Our goal was to raise $20,000 during the month of May. 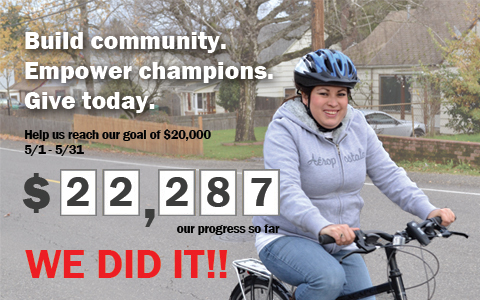 With an incredible push at the event on Friday– including a last minute auction of Cycle Oregon Week Ride tickets and a matching donation in the final hour – we raised $7,435 in one evening, pushing our grand total to $22,287. This is an incredible success that we could not have achieved without the support of our community – donors, volunteers, staff, and partner organizations. Funds raised during this campaign will directly support all of our community programs, and will allow us to broaden access to bicycling and its benefits in underserved neighborhoods. from Community Cycling Center on Vimeo. A special thank you to everyone who came out to our spring fundraising event and workshop warming party. It was wonderful to see both familiar and new faces fill our space. The event would not have been possible without the support of Russell St. Bar-B-Que, Bipartisan Café, Hopworks Urban Brewery, Reverand Nat’s Hard Cider, Dave’s Killer Bread, and Metrofiets. In addition, the Cycle Oregon tickets were generously donated by Stoll Berne. Thank you for helping us achieve this goal! Together, we are creating a healthier, safer, and more equitable community.